It is important to realise that the rain gauge measures the amount of rain, not whether it is raining! The diagram shows how the rain is measured (click to enlarge). A 5″ diameter funnel catches the rain which drips into a one of a pair of buckets on a see-saw. When the bucket is nearly full the see-saw tips, clicking a micro-switch, and the bucket empties. 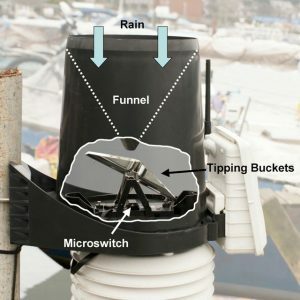 Now the other bucket starts to collect the rain. For my rain-gauge, each tip represents 0.01″ of rain. 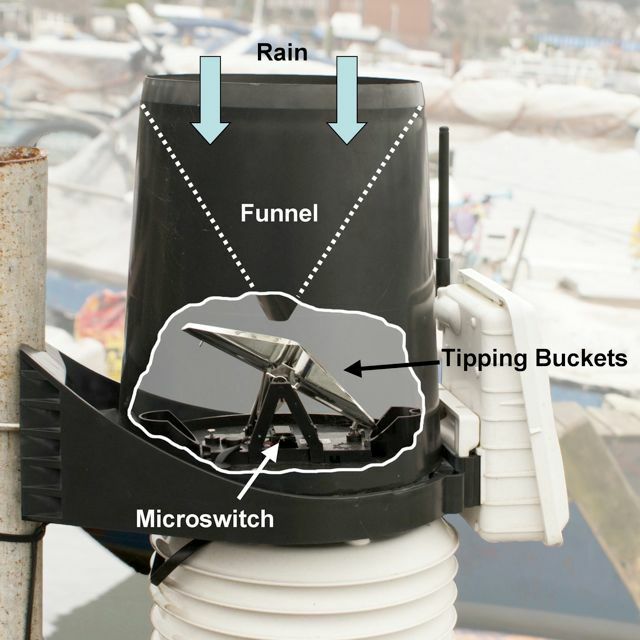 That means that if it is raining hard the buckets fill and empty frequently and the data will indicate continuous rain. However for light rain or drizzle the bucket may only fill after a time so for most of the time it will look like the weather is dry! Also early morning dew might just be enough to fill the bucket and cause it to tip – so if you see 0.3mm of rain (0.01″) indicated for the early morning – that’s probably why!